BOTTOM LINE: A difficult, but necessary, depiction of the dehumanization of American slaves and their masters. There is no end to the abyss of horror that lies beneath the sickening chapter of human history known as American slavery. Slaves were not just stripped of their liberty, but their humanity. They were not just forced to reap the harvests of their masters; they were forcefully raped by their masters. In one nauseating scene in Thomas Bradshaw’s play Southern Promises, a woman is interrupted during supper and told that she is being sold that very evening. As she turns to say a final farewell to her husband, knowing that she will never see him again, he is commanded to gather wood so as to disrupt a prolonged goodbye. Her master then rapes her, declaring that he must have her one last time. As he violates her, he bemoans that he “will miss this.” Brokenhearted and fully degraded, the woman limps away clutching a duffel bag for support as she is taken to the home of her new master. Southern Promises tells the story of a dying slave owner (Darby Davis) whose last wish is to free his slaves after he passes. Unfortunately, he is survived by his wife (Brittany Zaken), who is not quite on board with her husband’s dying wish. When her abolitionist brother-in-law (Jahsiah Rivera) tries to convince her to comply with her husband’s request, she declines, claiming that slavery is “God’s will.” When he soon asks for her hand in marriage, we are led to believe that it is a ploy to take control of her property and free the slaves. But soon it becomes clear that he is persuaded by her claims of the “virtues” of slavery and intoxicated by his power as a “master.” He descends into subhuman levels of brutality and tyranny. Bradshaw cleverly makes the case that the institution of slavery had a dehumanizing effect not just on slaves but on slave owners as well. Bradshaw’s play is provocative and upsetting. I found myself depressed and upset for at least 48 hours after it ended. Not that I was expecting a pleasant experience, but the way that Bradshaw details slavery's horror makes it utterly hopeless. In one scene, a master declares that he plans to castrate his slave before burying him alive. The scene captures the sadistic imagination that slave owners employed to innovate new forms of torture and murder, but it’s a challenge to sit idly by and witness such cruelty without screaming. Performed by The Bats, the Flea’s resident volunteer acting company, the production is relentless. Every actor in this ensemble is fearless and unapologetic as they tell a story that is obviously very personal to them. 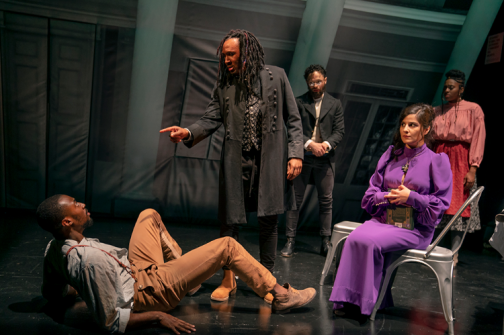 Before the play begins, the entire company delivers a preface in which they relay that every cast member identifies as a minority or an artist of color, and thus black and Latino actors portray white slave owners. This brilliant casting approach keeps us focused on the phenomenon of human cruelty rather than white crimes. This seems to be exactly the point that Bradshaw is driving at. Shakur Tolliver stands out as Benjamin, the main slave in the narrative; he bares his body and soul as he throws every fiber of his being into his excellent performance. Director Niegel Smith (the Flea’s artistic director) brilliantly creates a Brechtian sensibility to remind us that what we are watching is just a play—a necessary reminder for a story so viscerally upsetting. Jason Sherwood’s imposing set design supports the play’s obvious theatricality while keeping it grounded in the context of American history. Bradshaw’s script is so dark and hopeless that I find myself at a loss for how to process this piece. If witnessing and indulging in cruelty and wickedness somehow brings your understanding of the universe into focus, then this play will surely prove useful. To me, it felt like pouring salt on a wound. And yet, I feel unsettled dismissing the play with this metaphor. Deep down, I understand that, while Southern Promises is unpleasant, it is necessary. It is important to understand and acknowledge the cruelty and evil of our country’s formative years. Bradshaw’s play is a brilliant, if torturous, cautionary tale about the cost of dehumanizing people, and understanding this danger is vitally important for an America that seems to be struggling to maintain a moral future. If the play is like salt on a wound, it is salt prescribed by a doctor with the assurance that it will help us heal in the long run. Southern Promises is by Thomas Bradshaw. Directed by Niegel Smith. Set Design by Jason Sherwood. Costume Design by Claudia Brown. Lighting Design by Jorge Arroyo. Sound Design by Fabian Obispo. Hair and Makeup Design by Nikiya Mathis. Violence/Intimacy Choreographer is Rocio Mendez. Stage Manager is Anna Kovacs. The cast is Adam Coy, Darby Davis, Marcus Jones, Timothy Park, Yvonne Jessica Pruitt, Jahsiah Rivera, Shakur Tolliver, Adrain Washington, and Brittany Zaken.